The use of laser technology has greatly benefited medical fields across the board, and dentistry is no different. Drs. Jennifer and Cory Chambers of Cobblestone Park Family Dental utilize laser dentistry to diagnose and treat various dental health issues, as well as perform cosmetic and general dental treatments. Thanks to laser dentistry, our dentists can provide faster, more comfortable dental care with a lower risk of complications and downtime, often with enhanced results. Diagnosis of cavities and decay. Our diagnostic laser helps us detect micro-sized bacteria that are invisible to the naked eye. This allows us to diagnose and treat decay, cavities and other dental problems early, helping you avoid more invasive, painful (and costly) treatment in the future. Gum decontamination. As a preventative treatment, our team can use laser dentistry to decontaminate the gum pockets to prevent the development of gingivitis and other stages of gum disease. The precision of the laser leaves the surrounding healthy gum tissue unharmed. Gum scaling and root planing. For advanced stages of gum disease, gum scaling and root planing may be necessary. We use laser technology to penetrate deep into the gum tissue and root underneath the teeth to thoroughly clean the area and treat gum disease. Gum reshaping (recontouring). We can treat gummy smiles with a soft-tissue laser to reshape the gum disease and create a more balanced gum-to-teeth ratio. Teeth whitening. 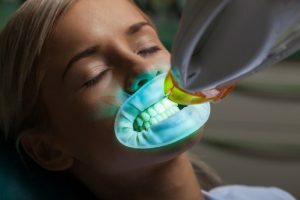 During your in-office teeth whitening procedure, we apply a professional-grade bleaching agent to the teeth and activate its products with laser light. The laser light enhances and speeds up the bleaching process. Treatment of cold sores/fever blisters/canker sores. Laser technology helps minimize pain from common mouth sores and speeds up their healing. Not only does the precision of laser dentistry mean enhanced treatment, healing and results, for many patients it also means a more comfortable dental experience. 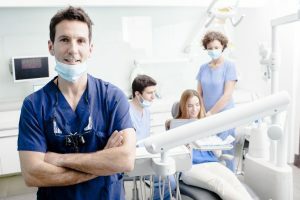 Laser dentistry eliminates the noise, vibration and pressure of dental drills and scalpels and allows us to complete procedures in a way that you will barely notice you are having any work done. Anxious or nervous patients no longer have to avoid dental work and can now sit back and relax as we do the work painlessly and efficiently. No matter what your dental needs are, Cobblestone Park Family Dental is ready to provide you with the best quality treatment and care. To learn more about our Laser Dentistry in Oklahoma City, please call (405) 603-8520 today.